When I was a little girl, my parents were fairly sensible when it came to the consumption of anything sweet. My Mum’s a wonderful cook, and we were allowed to eat the odd pudding on special occasions, but day-to-day meals were more likely to end in a handful of grapes or a little pot of yoghurt than anything more exotic and sugar-laden. I’m not saying we were deprived – we ate the most incredible home-cooked meals – but let’s just say mine was the only mother I’ve ever known to put packets of Sunmaid raisins in the goody bags of trick-or-treaters come Halloween. This abstemious approach to sugar may be partly to blame for the insatiably sweet tooth I have in adult life. I imagine it’s also the reason that one of my enduring childhood memories is of our au pair sitting down at the breakfast table, reaching for the honey jar and scooping out a giant spoonful, before sticking it straight into her mouth. I wasn’t very old at the time, and these were definitely pre-Nigella days, so such a display of indulgence was both surprising and enviable. When asked why she did it (I’m not sure my Mum was entirely impressed with the idea of her impressionable and sticky-fingered children following suit) our au pair‘s answer was simple; ‘I am a honey monster’. The only other person I’ve ever known to love honey with quite as much passion is a friend from university. She loves the stuff, eating it on toast, pouring it over sticky sausages and I’m sure I’ve even seen her reading a book about the history of honey. It therefore seemed fitting that when her birthday came around this year, I made a honey cake. My other option was chocolate biscuit – one of her favourite kind of cakes – but as she’d had it at her wedding last year, I didn’t really feel the need – or want – to compete. Honey is a wonderful ingredient. The first sweetener in recorded human history, its earliest use is thought to have been hundreds of years BC, and people throughout the ages have incorporated honey into their daily lives; from cooking to cosmetics, as well as using it for its soothing, medicinal properties. The appearance and flavour can vary depending on the nectar source, from a mild, almost clear liquid to an intensely amber syrup. If you’re into your honey, there’s a whole world out there to explore. Doing a bit of research online, I discovered Nigella Lawson’s Honey Chocolate Cake, a gorgeously gloopy concoction decorated with little marzipan bees. It looks lovely, but I wanted to make something a bit sturdier; a cake that I could stack in tiers and ice in buttercream to survive my journey across London to the restaurant we were eating at. 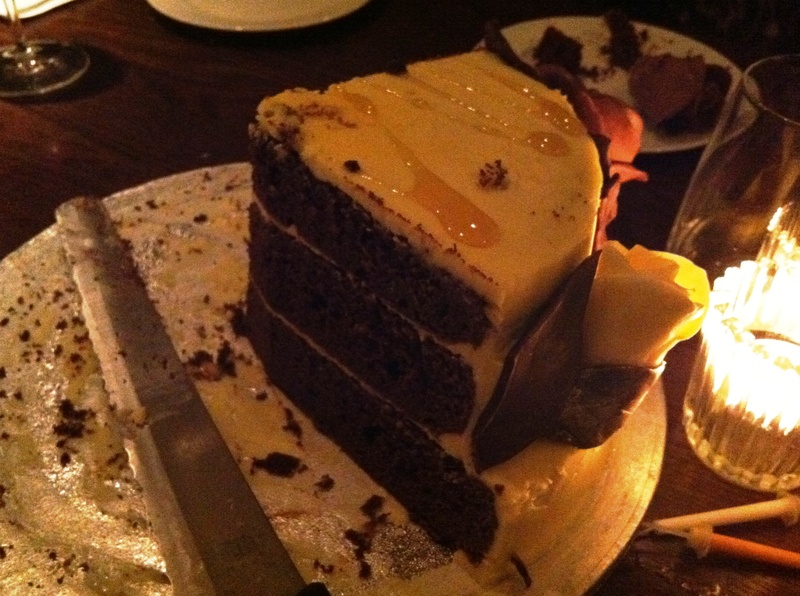 I realised that the answer was a simpler chocolate sponge, not too sweet so as to allow the rich, sweet flavours of a pure honey buttercream to shine through. The icing tastes like the best honey sandwich you’ve ever eaten – the perfect combination of slightly salty butter and smooth runny honey – while the cake is dark and moist. The decorations are all made of modeling chocolate as I’m not a big fan of marzipan, and it was so much fun rolling out the little bees before studding them with little almond wings. This is such a perfect birthday cake – a little more exciting than your average chocolate sponge, but comforting in the familiarity of its flavours. And if you don’t have a bday coming up, I’ve read that honey cake (albeit not a chocolate one) is a traditional Christmas cake in Denmark, so with 25th December fast-approaching, you’ve got the perfect excuse to give this a try. The cake is also incredibly moreish, and I’m taking it as the ultimate compliment that the birthday girl wrapped the last remaining piece of cake in tin foil and wedged it into her handbag before leaving the restaurant. Preheat the oven to 180 degrees C. Grease and line two 20cm round cake tins. Blitz the flour, sugar, baking powder, bicarbonate of soda and cocoa in a blender for 20 seconds. Add the butter and blitz another 20-30 seconds. Add the eggs, vanilla extract and sour cream and pulse until just combined. Pour the batter into your prepared tins and bake for 30-35 mins, until a skewer inserted in the middle comes out clean. Don’t open the oven for the first 20 minutes, but after that do check your cakes as some ovens may cook them a little quicker. Once cooked, remove from the oven and allow to cool completely. Cream the butter and sugar in a mixer for around 5 minutes, until light and fluffy. Add the honey and whip until fully incorporated. Dot a little icing on your cake board or plate and secure the first cake, smoothest side up. Spread approx. one third of the icing across this cake, then sandwich the second cake on top. Spread a thin layer of icing over the cake (your crumb layer) then pop in the fridge for around half an hour to firm up. Remove from the fridge and ice with the remaining buttercream, smoothing the edges with a knife dipped in hot water for a completely smooth finish. 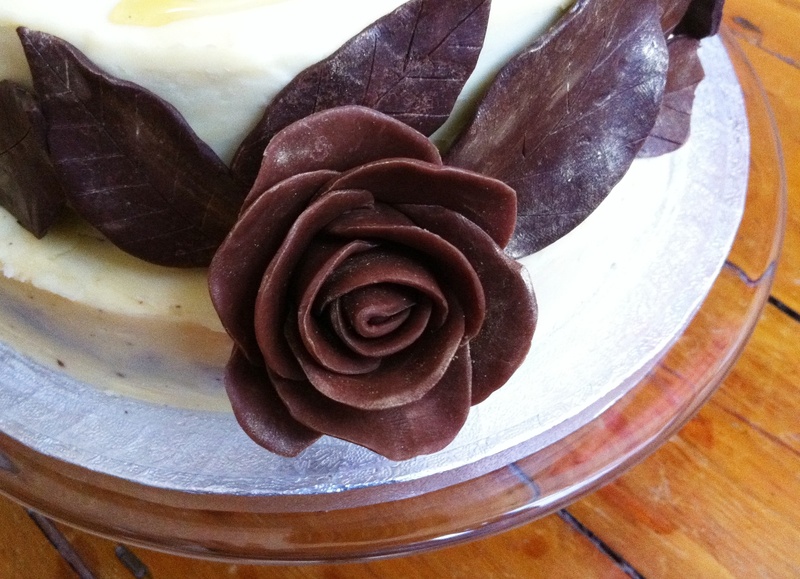 If you want to make chocolate roses to decorate the cake, read the tutorial here. For the chocolate leaves, roll out a thin layer of dark modelling chocolate. Cut into leaf shapes and score a vein patter with a sharp knife. Dust with gold dust, if you like. 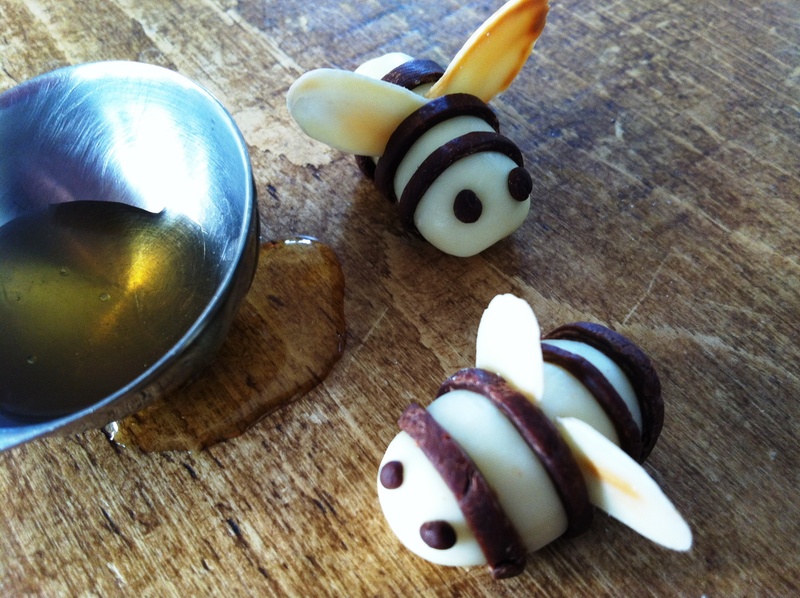 For the little chocolate bees, take five marble sized balls of white modelling chocolate and roll into fat sausages. Cut thin strips of dark modelling chocolate and press into each sausage to make stripes. Roll two tiny balls of dark modelling chocolate into eyes, then take two roughly even sized flaked almonds and press into the bees’ back as wings. 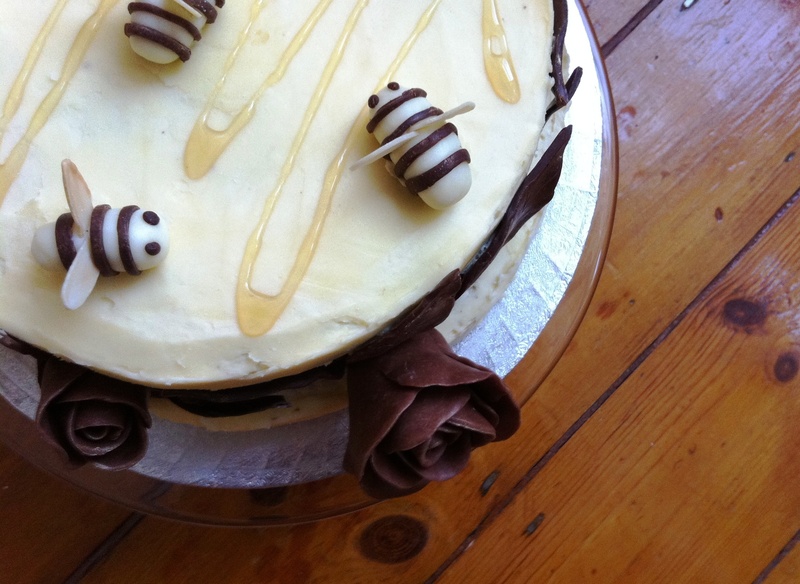 Secure the roses, leaves and bees to the cake with little splodges of buttercream. Fabulous cake. I love the roses and bees. Wow! What a beautiful cake. But I do think I might give your friend a run for her money as far as honey-loving goes. 😉 It’s my favorite ingredient and I kind of pull the same moves as your nanny–eating it straight from the jar is delicious! I have never heard of it combined with chocolate in a cake though… how clever! What a stunning cake and a lovely combination of flavours. I love honey and will definitely have to give this cake a go. I’m not sure about making the decorations though – yours looks so beautiful and professional. Love the bees and roses. Absolutely adorable. Love the bees’ wings! This cake is beautiful and sounds amazing! It’s so much more special than chocolate biscuit, in my mind. I’m glad you chose to make it instead for your friend. The bees and flowers look amazing 🙂 love the layers!! Gluten Freezen – the bees are seriously cute, it’s quite hard to pop them in your mouth! Amy – thank you. I hadn’t really thought about combining chocolate and honey before, but because the chocolate cake isn’t too sweet it really works. Baking Addict – thank you 🙂 If you want to have a go at the decorations, do read that rose making tutorial. It takes you through step-by-step and makes it seem a whole lot less daunting. Savory Simple – they are proving very popular! Kaitlin – chocolate biscuit has a special place in my heart, but it’s more fun to do layer cakes as you can play around with the icing etc. lovely writeup on honey ….the cake looks so beautiful 🙂 the bees are adorable ! 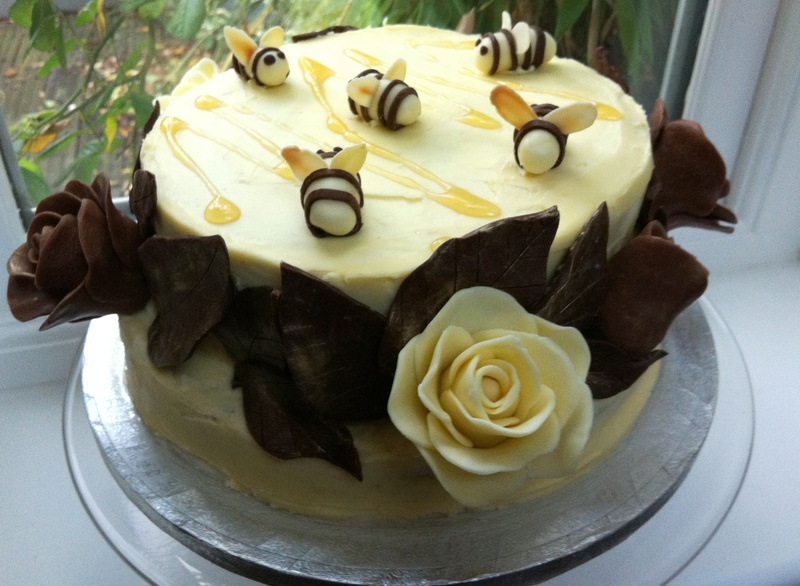 A BEAUTIFUL cake and for a bee lover, this is a wonderful recipe and GORGEOUS decorating too! I LOVE it, can you tell?! Oh wow, you’ve excelled yourself with this one. I cannot believe you carried it around London as well. You are some friend! Just lovely! What a beautiful cake. I definitely would have stuffed the leftovers in my bag (and then my face). Very impressed with the chocolate roses 🙂 and good call on chocolate over marzipan, marzipan is an abomination. A Spoonful of Yumm – thank you, the bees seem to be everyone’s favourite bit! Julia – haha, absolutely! And agree, I’m not a big marzipan fan either, chocolate all the way. A pretty and delicious looking cake! I love the cute decorations. Wow. How utterly adorable! Seriously impressed with your roses, that’s a skill I’ve never perfectly mastered. It inspires me to try again. And the bees! So cute! lovely bees. i love honey! Wow what a gorgeous cake. Honey I love too and your little bees are so cute!! Oh my god this is absolutely amazingly beautiful. I’ve never had honey cake but I would love to try it because sometimes I think the taste of more natural sugars would be great – I can feel too oversugared sometimes with some buttercreams! Stunning, and great idea with modelling chocolate – I hate marzipan so will check that out! Those flowers are just so beautiful, definitely put the finishing touch to that cake! 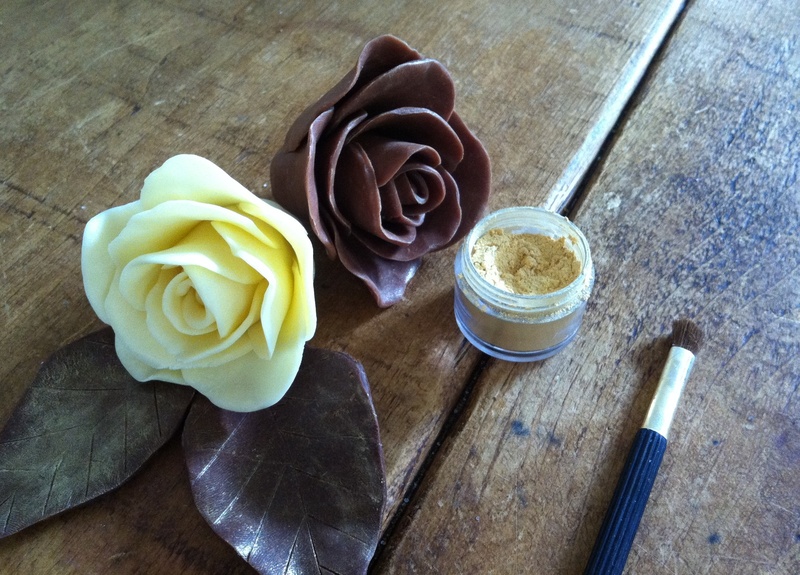 Susan – it just takes a little practise, honestly, follow that tutorial and you can easily make the roses in minutes! Slutty Cutlery – this is the cake for you then! Becs – I’m afraid there’s a fair amount of sugar in the buttercream too, but the honey does add a lovely, naturally sweet flavour. 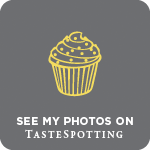 Working London Mummy – I can tolerate marzipan in very tiny amounts, but if you can substitute chocolate, I’m all for it! the cake is so so pretty, I love the bees and the flower . What a fab creation, seriously beautiful and amazing…love it! Those honey bees are gorgeous, but wow, those roses are impressive!!! Your cake looks utterly gorgeous, and delicious! Looks gorgeous. I love the flowers. so cute…love the little bees…. Urvashi – do let me know what you think of the buttercream if you end up making it! Jennifer – aw, thank you. Honestly they’re really simple to make. What a lovely friend you are! This cake looks amazing and th ebees are just perfect! The Caked Crusader – thank you! That is a beautiful cake! I love the cute little bees! Absolutely gorgeous. I’m off to check out the chocolate rose tutorial. Its something I have longed to try. This is a seriously beautiful cake…YUM! Pretty. Good. Food – it was! Deeba – thank you. And do check out the tutorial – it makes it all so simple. I made and posted about Nigella’s honey cake some time ago. It is adorable and a crowd pleaser but it didn’t turn out as moist as I imagined it. This cake looks really good, and you really outdid yourself with the decoration. Wow!